The Oregon Chocolate Chunk Hazelnut Cookie Is Here! Here are the main components: Moonstruck Chocolate, Hazelnuts from Duyck's Peachy-Pig Farm in Cornelius, OR (picked up at the St. John's Farmer's Market), Farm Fresh Eggs (from St. John's Farmer's Market as well) and a brand new Better Homes and Gardens Baking Sheet. Katie and Lily mix the flour, et al, with the butter, etc. We couldn't wait to try them! The Oregon Chocolate Chunk Hazelnut Cookie. (Portland, OR is the City of Roses, hence the floral accent ;-> ) We hope this is a winner! Voting begins June 30th and ends July 27th! 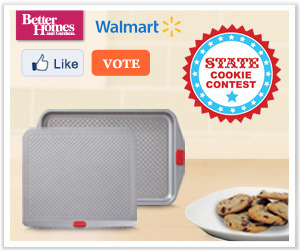 If you choose to vote for the Oregon Chocolate Chunk Hazelnut Cookie I would be most appreciative. And if you spread the word to your friends I just may have to bake you a batch!